New Pair of 99-06 Chevy Silverado/GMC Sierra Extended Cab Slip On Rocker Panels Bottoms. Fit both the 3 door and 4 door extended cabs. This is a replacement panel, it is the lower rocker skin. It is not meant to be slipped over, that is the termnology in the industry. Cab corners are also available, Just let me know what you have. These fit as well as Original OEM Parts. The rockers are die-stamped for an exact fit. There is a unique Left and Right Rocker and are not a "Uni-fit" generic part. These rocker panels are not straight from one end to another. They bow exactly like the original rocker panel. 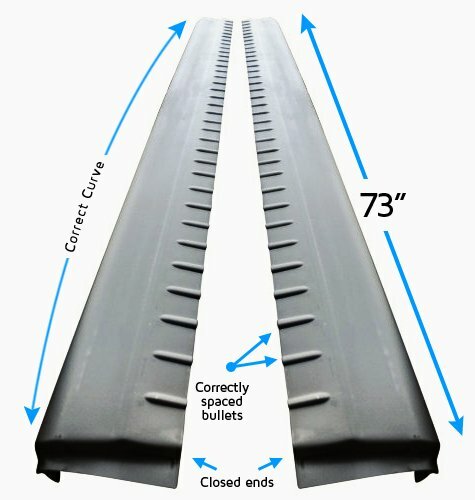 The bumps or bullets are in the exact same place as the original rocker panel bumps or bullets on the bottom of the cab. These are made to cut out the old metal and weld in the new metal not just a slip over and done replacement! Made from Galvanized Steel. These are 1mm thick or 20 gauge. There will be a FREE shipping and handling fee in the lower 48 US states. Please Contact me with any questions. When e-mailing, please mention item and auction number. AK, HI, PR, please contact me for a quote. I am not sure if I can ship them to you at a reasonable rate. Each Rocker Panel Weighs 6 lbs. If you have any questions about this product by KeyParts, contact us by completing and submitting the form below. If you are looking for a specif part number, please include it with your message. E.S.RITCHIE & SONS angler Bracket, 2-3/4"
SBTB3400 - Laird 3/4" Straight Bracket - Black Stainless --- LAIRD 3/4" hole stainless steel straight black trunk groove bracket. Order Motorola style 3/4" hole mount, cable and connector separately.